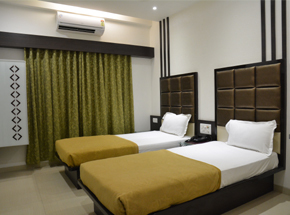 Hotel Corona, Bharuch offers exquisitely furnished and fully equipped Silver Room, Gold Room and Platinum Room provides you ease of access every time you visit Bharuch and suit rooms. It combines the convenience of all the facilities and amenities offered by an elegant Business hotel. It is the ideal choice for your accommodation in Bharuch. Hotel Corona has a pure veg multi cuisine restaurant in the name of FLAVOURS. The ambience at flavours is elegantly casual with relaxed seating which assures the best of time every time you visit us. We also offer a small children's play area with play equipment. Above this Hotel Corona also offers an Open party plot for marriage/reception/birthday/kitty parties with a capacity of 150 pax. We provide our guests within a quiet & relaxed ambience in our specious & richly appointed rooms. Well furnished 34 rooms Luxurious with attached bath. 24 hrs. running Hot and Cold Water. Colour T.V. with cable Channel Round the Clock.